How to reconcile a received invoice with an invoice to come. Once you have received the official invoice from your supplier and assigned it to the job, you will want to reconcile it with the packing slip you have entered to make sure you have been correctly billed. This can be done from the Reconciliation area to the left hand side of the job card under costing. If the invoice to come only has a photo listed for it, then reconciling is fairly straight forward. 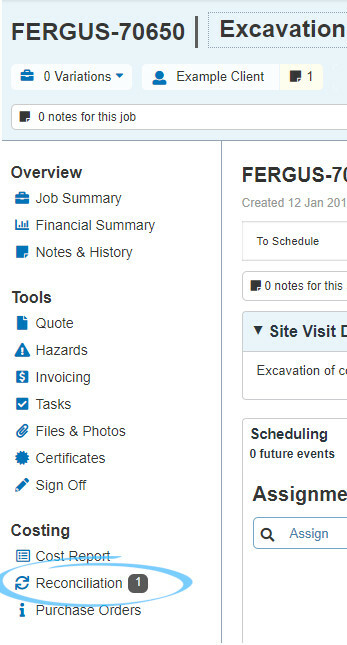 Once in the reconciliation page, you will just want to click the camera icon next to the invoice to come and compare the photo document with the line items on the invoices received. If instead the contents of the packing slip have been entered into the invoice to come, you will also need to match up the line items in it with the invoice received. This does add an extra step, but also means that you can better verify that the two documents match up and partially reconcile documents if some items are missing. The process is initially the same as for a photo invoice to come, though after hitting confirm you will be asked to match up the line items in the documents. Items with identical names and pricing will auto-match for you and will just need to be confirmed. Items that have no match found can instead be matched manually by ticking both the item ordered and purchased. If there are any items left over after reconciling, then the document will be marked as partially reconciled instead and can then be matched to another document. As a final option, you can also convert an invoice to come directly into a received invoice if the supplier is unable to provide a CSV. From there you will be shown the photo attached (if available) and asked to enter the line items onto the invoice if they were not already present. You can then complete and send the invoice to your accounting package in the same way as a paper invoice.